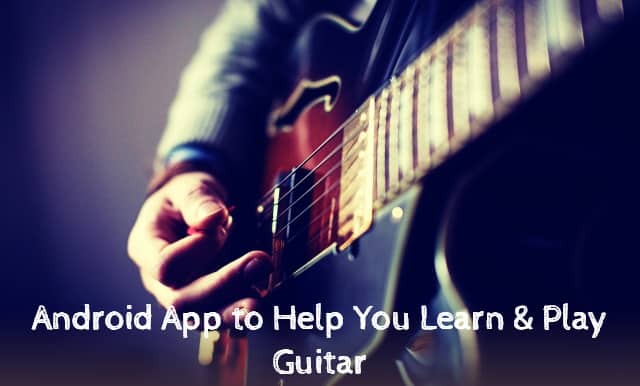 Apps will be a great help if you want to learn guitar. When I learned guitar, I don’t know about all these apps, but now everything is available on your phone. Technology makes everything so convenient and easier. But, in this crowd of so many apps, ones wants to use best apps. Do not get confused with all the apps because not all the apps is worth of investment of your time, Have some patience and enhance your guitar skills. So, check this list of top 10 Best Guitar apps For Android. If you are new to music and not yet sure about the guitar, this app is for you. Real Guitar is a guitar simulator app. It can simulate both electric and acoustic guitar.This app gives you the feel and sound of playing the guitar from your phone so, If you are in the mood to buy a guitar just to check your interest in it, don't waste your money. Use it and realize it. The real guitar comes with 16 track loops that you can play. It also gives you the recording feature. Two modes – solo and chords. With Electric, Acoustic and clean electric guitar sound. It means we can play the song and then record them and listen to them in mp3. So, are you ready to have fun? If you need to develop that crucial skill that every Musician should have that are rhythm and tone, then this app is for you. The perfect ear is not only for guitarist it can be used by any musician who plays any instrument. Provide teachers for note singing. Sort out the problem of distinguishing different tones. Perfect Ear comes with dozens of chords, rhythm training exercise, scale, and chord to make you understand music. Provide Theory articles to increase knowledge. This application is so excellent that you might get addicted. So don’t wait anymore, go and download Perfect Ear just right now. Most metronome guitar apps on the play store are too basic, they can be used only until you’re a beginner and when you put just a step ahead of beginner level their job is done because they have some limits, at that time you will want to start using Metro numerous, best at its work. It comes in 3 languages English, German, Russian. Subdivisions in 8ths, 16ths, Triplets, Quintuplets and even Septuplets. A different setting can be saved in the beat list. Now set a different volume for each subdivision by using a metronome. Learn to play guitar whenever you want and wherever you want. This app records your game and provides instant feedback on timing and accuracy. This app is designed by an expert musician who makes it so unique for beginners to professionals. Video tutorials guide you step by step. Fun and addictive gameplay can make learning easy. This app also offers numbers of the song to play along with. So grab your guitar and start playing it now. You will get amazed that how much your guitar playing skills improved. It listens to you play the guitar. Provides you feedback on your performance. It provides awesome songs and tutorials from a basic level which suits you. Through gameplay and challenges, it makes learning fun. Not only Guitarists even Pianists, Bass & Ukulele players. The best Teacher for Complete Beginners. Help for Advanced & professional musicians. If you are done with chord formations, then proceed to the next step by improving your playing with the use of scales. All chords have their scales and learning these scales will increase the much more natural sound level of playing. Smart Chords Scales shows and play different scales like Major, Chromatic, Dorian. Fretboard can be explored up to the last fret or can be reduced to just three frets. A mere fingertip can play the notes. In the market, there are numbers of guitar tuning app, but no one can beat GuitarTuna. It working is very simple first you pluck the guitar string and the app listens with your device’s microphone, and the screen displays the note. So these features make it simple for beginners and advanced levels there are 1000 of alternating tuning. Background noise cancellation technology can make it work even in the noisy area. Developed by the world’s leading audio engineers and designed by a professional guitarist. Make your skills better by chords, riffs, tabs. Can give the app appearance of your guitar instrument by choosing different headstock visuals. GuitarTuna and Yousician built on same technology. Gives Professional accuracy for advanced players. For super fast tuning, it provides Auto mode tuner. So you don’t need to find another application if you pick another instrument. This app is look alike of Ultimate Guitar Tab but the good thing about this app it is a free version, and the sad thing is with ads, Though ads can be removed easily if you buy the pro version of the app. This app is similar to an ultimate guitar but not with all features because it lacks tuning, video playback, and auto scroll. It contains vast song library with the easy search option. Offline access mode so, you can access to your favorite tabs. Chord diagrams for guitar with multiple variations and left-handed mode. Gives tool for chord transposing. History option for browsed songs. You can share this app. If I need to suggest all in one app for guitarists, SmartChord is the app you are looking for. It helps you to learn different chords, but with time it becomes something more interesting. The smart code provides you everything that you need to generate a good music. It also provides function of Transposer. Ear training is also it’s one of the features. If you want to learn different chords, this app is for you. This app can act as a teacher in a matter of teaching chords. It is one the best app for beginners as well as intermediates, and it provides you with the reverse option so that you can play back to find that you are playing right or not. Any of the two Guitar electric and acoustic can opt. Learn chords while having fun. It can be used for both Acoustic and Electric guitar sound. Best for beginners and intermediate. Free, Simple and Very easy to use. JamBox Light is a chord and app for the guitarist. It’s at number 10. This app plays current chords in modern variation. This app is used for both right and left-handed guitarist. Provides you 22 chords and 13 scales. Display notes on the screen. Standard tuning is only available. The left-handed guitar is also available.